Coilhouse » Blog Archive » Occupy Oakland Reportage, Part II. And on Saturday Nov. 5 you are urged to go to your corporate bank, withdraw your money, and move it to a local credit union. Or do it earlier than Saturday! My friend Philip says: “I am shutting down my bank of america checking account and transferring my money to a credit union in nearby berkeley on thursday, november 3rd.” Too big to fail? We’ll see. Elisa Salasin and Myles Boisen will be creating an Occupy Oakland Photo Wall for the coming First Friday Art Walk in downtown Oakland. If you have images that you’d like to contribute please send the electronic files to [email protected] Selected images will be printed on 4×6 photo paper and added to a wall collage. Deadline for image submission is Friday, 11/4, by noon. Come and see the images of Oakland in solidarity! The wall collage will be on display at Warehouse 416 (416 26th St.) — in the back of the Snarky McF/Buttons to the People shop space, beginning Friday, November 4th at 6 p.m. After First Friday the display will be moved to Oscar Grant Plaza in the heart of Occupied Oakland. 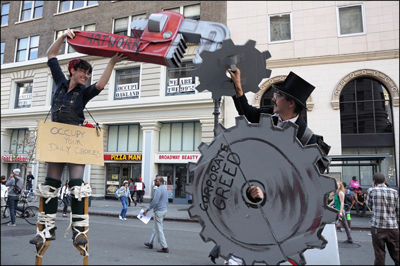 Welcome to the Oakland General Strike (article) Ken Knabb is another excellent independent local writer, and his situationist synopsis is worth reading even after the fact. We Are Not Moving (video) This sobering short film by Corey Ogilvie shows Obama and Hilary Clinton talking about supporting free expression and assembly in the Arab world, skillfully intercut with videos of American people getting clobbered in the streets of New York and elsewhere. Rachel Maddow on the Oakland General Strike (article) Opinion piece with a more positive spin on yesterday’s events. Many good photos as well. I have chosen to illustrate this volume with a few more of my favorite photos from Nov. 2. The image titled “Paul Jim Ann Nina” (left to right) is a very special one for me, but it requires a bit of explanation. I had my eye on these four friends as soon as I arrived at 14th and Broadway on the day of the general strike. They were clearly in high spirits and asked me to take their photo together, to provide a centerpiece for Ann’s upcoming 80th birthday. We got to talking, and I asked them if they remembered when they had first turned out for a demonstration. The answers came so quickly I could barely write them down (they may have to correct me once this comes out!) Jim and Ann were together in Madison WI. 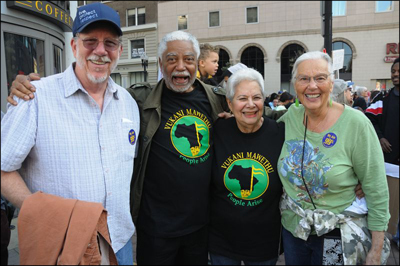 at a civil rights march in 1960, Nina took to the streets in 1961 against segregation, and Paul remembered first protesting the draft in 1967. 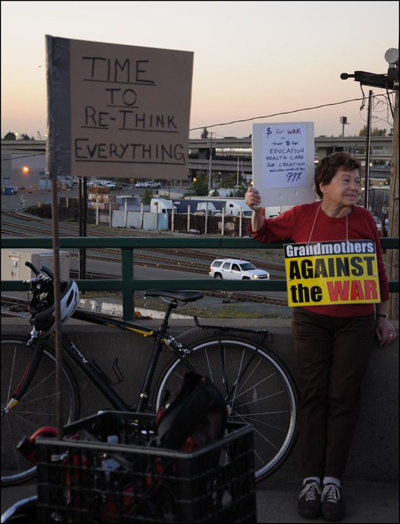 After the triumphant general strike and mass day of action on Wed. Nov. 2 there has been a lull in local Occupy actions. The attempted midnight takeover of the former Traveler’s Aid building at 520 16th st. resulted in a massive multi-departmental police response, flaming dumpsters, and broken windows around downtown Oakland. Rain has started falling in Oakland, and energies have turned toward cleanup, keeping warm, more building occupations, and what to do about destructive tactics (see media links listed below). 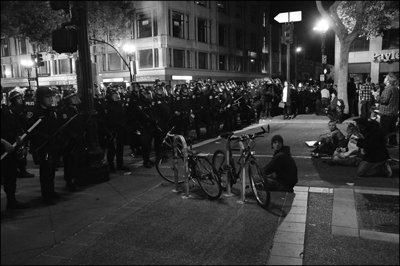 Tonight, Sunday 11/06/11, I stopped by the GA at Oscar Grant Plaza at around 8:30 p.m. It had been a chilly couple of days, and with a night breeze blowing through downtown Oakland it seemed much colder than the official 57º listed on my iPhone. With the onset of daylight savings time it had already been dark out for three hours. Earlier in the evening a “Declaration of Solidarity with Neighborhood Reclamations” (i.e. taking abandoned/ foreclosed buildings for local use) was adopted. 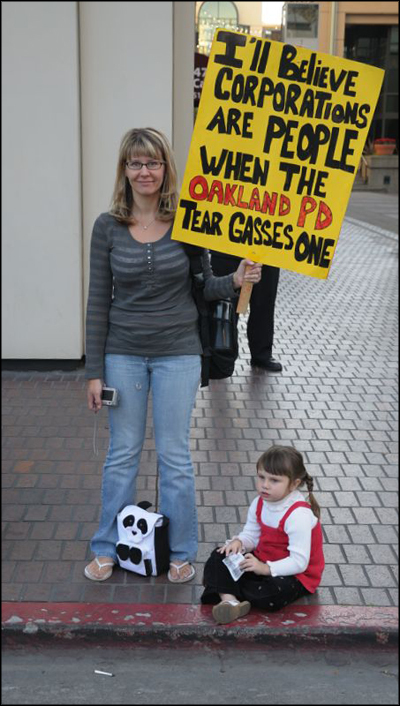 I got in on the tail end of a proposal demanding the return of possessions seized during the “cleansing” of the plaza, before the strike, before the swelling of the Occupy Oakland ranks, before the tear gas of 10/25/11, even before my first post in this series. It seemed like an awfully long time ago, but really it has only been twelve days. I was impressed that almost 150 people were present to vote on the proposal. A nurse from the crowd gave a slurred but well-received appeal for more sanitary conditions at the camp, repeating the sensible advice our mothers told us: wash your hands with soap, clean up after yourselves. Someone brought up the idea of shutting down the Bay Bridge on 11/11. One of the facilitators named Adam gave an eloquent and hard-edged discourse on the recent property destruction. His point was that there is room in this movement for those who follow the nonviolence of Martin Luther King, Jr. as well as those who espouse the “by any means necessary” philosophy of Malcolm X. Adam received enthusiastic responses when pointing out that more radical autonomous actions need to be well-planned rather than random, and that this is not the time to start fragmenting or in-fighting. He was followed by some soft-voiced pleas for moderation and non-violence. I got too cold and went home to write. 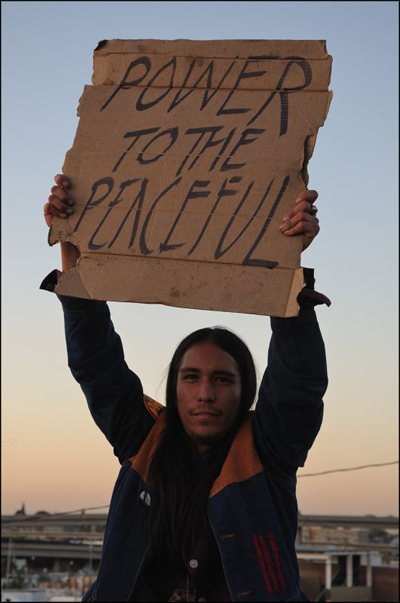 Here is what you can do right now to support the energy of the Occupy movement, to increase momentum, to get involved. Join the call to get your money out of the big banks. Don’t take other people’s word about it – do some online research about the bank which currently holds your money. Do they profit from the war-making machinery, prisons, immigrant detention centers, predatory lending, massive foreclosures, derivatives and so on? If you own mutual funds, stocks etc. also consider moving that money to an organization that will do some social good. Go to credit unions and community banks and talk to the managers there about their investment strategies and what they plan to do with your money. Tell your friends “I just moved my money from ______ (big bad bank) to _______ (groovy local credit union)” and get them to join you. Please let me know of any alternatives you have found to the mega-banks, as well as positive money-moving experiences you have had. Democraticunderground.com references an ABC News report (I can’t find this ABC piece online to verify) that 1 million people have moved their money out of big banks so far. And KPFA DJ Davey D Cook reports on Facebook that the Wells Fargo branch in downtown Oakland actually closed down (for the second time in one week) on Saturday’s bank transfer day. When I left Sunday’s GA I noted that the entrance of the Wells Fargo bank at 12th and Broadway was boarded up, and made a mental note to go by tomorrow to check on its status. 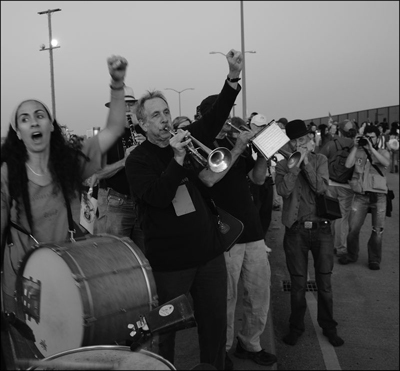 Various campaigns to fund OWS publications and documentaries are up on www.kickstarter.com now. Or donate directly to your local camp. Ready-to-eat food is always needed, as are kitchen supplies, clothing, rain gear, warm socks, plywood, tarps, blankets, and so much more. Lists of needed items are kept on the local Occupy websites listed above. Consider donating used, recycled materials wherever possible and please be thoughtful in your purchasing and vendor choices. C’mon now people, it’s winter in most parts of the country. Current temperatures are 45º at OWS, 43º at Occupy Boston, and 39º at Occupy Vancouver. Do something nice for the Occupiers who are working for your future and your kid’s futures. Donate, and Dig Deep! If circumstances keep you from getting involved in the aforementioned actions, tell your friends, coworkers, family, church congregation, Civil War re-enactment group, whatever. But really people, you have to walk the walk before you can talk the talk. Get on down to your local encampment, bring a donation, attend a GA, talk to some real people, take the pulse of this historic movement for yourselves! Don’t believe what the corporate media and their talking heads have to say about it. Following the three Ds will expose you and your families to new ideas and perspectives, let you sleep easier at night, help you to shed unwanted pounds fast, and make YOU the hit of your Thanksgiving and holiday parties! FRIENDLY GET-TOGETHER FRIDAY NOV. 11 7:30 p.m. I propose we get together in person to toss some of these ideas around, get energized, and find new and creative ways to organize for the next phase. Please meet me on Friday Nov. 11, 7:30 p.m. at Pacific Coast Brewing Company, 906 Washington St. Oakland 94607, (510) 836-2739. The beers are on me! I will also be collecting donations and money to go directly to Occupy Oakland. Please come prepared to give generously in any way you can. If you haven’t been, Pacific Coast has a great beer selection, and tasty pub food too. And they closed in solidarity with the general strike! Thirteen Hours at the Oakland Strike (article) A thoughtful and fresh account of what it was like to be there at the general strike and Port of Oakland action by Craig Clevenger. Photos by Myles Boisen. Shot by Police With Rubber Bullet at Occupy Oakland (video) This is a must-see – forward to all of your friends and let’s see if we can make this viral. This videographer was far back from the police line on Wednesday night, Nov. 3, not taunting police or doing anything but taping. The video clearly shows a policeman shooting him, and his reaction. It is scary to think that this could have easily happened to me that night, or to any of us. Yes, this is Oakland, not Syria or Egypt or Libya. Occupy Oakland’s Takeover of Traveler’s Aid Building and Police Response (video) Several videos, including one documenting the Travelers Aid building (520 16th st.) takeover are now up on the Occupy Oakland home page. This does clarify the circumstances of this confusing night, demonstrating that the occupation of the building was a mass action and not just the work of a few. An eloquent statement on the building occupation by some friends of Occupy Oakland. The comments to the article are by far the best part of the dialogue, showing a range of opinions and lack of consensus on this action. Occupy Protestors Disavow Oakland Violence (article) A sympathetic news article on the 11/02/11 violence and the complexities of distancing the Occupy movement from destructive autonomous actions. Media watchers like me will be intrigued to find out that this very same article has showed up on the KTVU TV36 media conglomerate website. The Thugs Are Not Us (article) An impassioned open letter to violent protestors from my dear friend Freddi Price. This has been posted to the Occupy Oakland site as well. Anarchy! Coincidentally (at least I don’t think I was being targeted directly!) I arrived at work the morning after the strike to find “Dear Occupiers, a Letter From Anarchists” stuck in the front door at my studio. I do support the ideals and commitment to organization of the anarchist movement. At the same time I have to condemn pointless destruction by those who have been referred to (whether accurately or not) as anarchists. Anyway, inform yourself about the real ideas behind theoretical and practical anarchy and make up your own minds. OWSnews.org (website) OWSnews.org is being launched by journalists and organizers at New York’s Liberty Park occupation and over 20 other occupied locations throughout the US. This service is specifically dedicated to aggregating and producing news reports on the OWS 99% Movement. This website also features many social networking capabilities which allow registered users to create their own profile, share ideas and easily communicate with many other journalists and OWS activists. 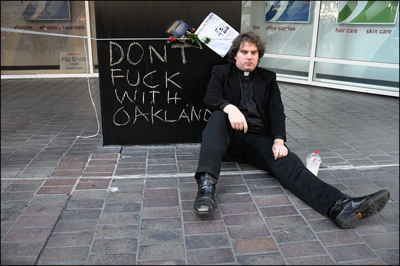 there is also an Occupy Oakland group where you can post comment and images. Be one of the first people to join this network by creating your own profile and contributing to the site by registering here: OWSnews.org/register. You know that windows aren’t people, right? If you’re against vandalism, call it that and don’t muddy the waters by calling it ‘violence’. Gotta disagree with you on that specific point, Jon. Intentional property damage can most definitely be considered a form of violence… albeit a more tenable one, depending on your point of view. I highly disagree with intentional property damage and I think the whole point of occupying is in applying a non-violence based strategy to show you are not okay with the way things are going without running in a mindless rampage of illegal acts. Occupy Oakland is misdirected. Mayor Quan is not responsible for the Federal bailout of the banks. She should not be the political scapegoat for Alan Greenspan, Ben Bernanke, Barak Obama and George Bush! Those four guys screwed up the country by providing loans too liberally, lowering rates, and bailing out banks. 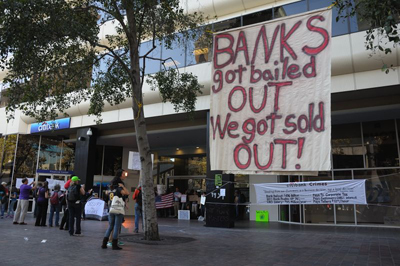 Unfortunately, Occupy Oakland has too many causes besides Bank Bailout. 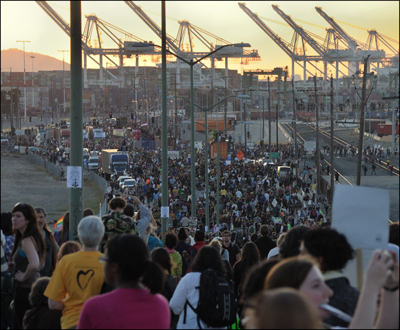 Shutting down the Port of Oakland was meaningless. Those people are blue collar workers, not white collar bank executives. Why don’t you go to Palo Alto, Atherton, and Pac Heights? That’s where the wealthy executives live. Those CEOs are the ones who are paid like kings while they layoff/fire the lowly workers. You guys worship people like Steve Jobs, who is no better than Wall Street executives. You should criticize the private sector executives, not local mayors like Jean Quan. She’s a mayor who has supported people throughout her entire career. She’s not part of the elite or the conservatives. She deserves respect for being a strong leader who supports the common people!